Declared outlaws by the Emperor, the Guild of Assassins strikes back hard. The Emperor must act fast. He needs someone to infiltrate the Guild. All attempts to locate the assassins’ headquarters have failed and Femke is already known to the assassins. So Reynik, the young legionnaire, must penetrate their inner circle to discover the Guild’s secrets. But secrets kept hidden for over five centuries command a high price is Reynik is ready to risk his life for the mission? 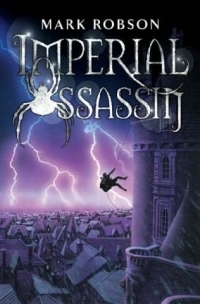 Mark Robson creates an interesting world for the Assassin’s Guild, leaving lots of unanswered questions of their origins. The action scenes are well choreographed and smoothly written, hence I found those the most interesting. I eagerly await the next instalment. 9/10. Once again, Mark Robson has created a fast paced tale of adventure, wit and cunning. The reader will be entertained by this enjoyable story, a couple of interesting twists, a big surprise, the well-orchestrated fight scenes and the thoughtful conjecture of what a secret conclave of killers might be like.